I had a quick lunch today at my beloved Western Australian Club. Unlike some other private clubs, it is an egalitarian club (they let me become a member after all) which has strong input from both men and women. The Club itself is run by a highly competent female General Manager, there are two women on the governing Committee, and the Chairman of its Younger Members' Sub-Committee is a woman. After all, why would I want to go to a club where there are only old men lounging around the place? Oh well - to each their own I say. Anyway, I need half an hour in the quiet haven of my club, away from the madding crowd. So while I read my favourite comic strip (Alex in the Fin Review - don't laugh - it's really good, and I think very accurately represents its subject matter! ), I ordered the confit duck salad for lunch. What a delicious, light-ish dish! A nice salad with various salady leaves and a sprinkling of sliced red onion for a bit a spice, and cranberries and pinenuts for additional flavours. But the highlight was of course the very generous morsels of shredded, juicy, succelent, duck meat cooked for hours in duck fat (no the fat is left behind when the meat is put in the salad, but you should know anyway that duck fat is full of good cholesterol, which actually works to lower your bad cholesterol). 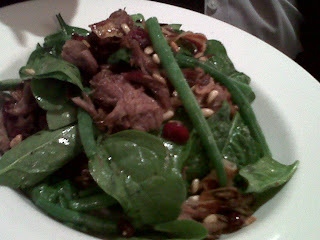 Ahh the simple joys - a juicy duck salad and a laugh over lunch.